Our intent is to provide some guidelines to help your team produce the standard they want (or need) so they can get more work done. These really do seem to be the right steps. I suppose my next team could outline their progress through the steps. 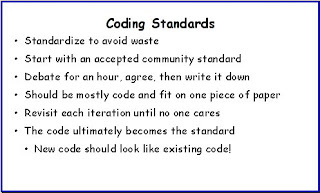 If you are looking for some existing standards to start from, we could post a few. I'll look into getting a story with examples together.